I don’t know about you but whenever I read the word “outbreak” my mind always jumps to those big Hollywood disaster movies where large groups of the world’s population are wiped out by some sort of plague. It doesn’t matter if it’s a disease or zombies – outbreaks are always bad news! So when I read that that Centers for Disease Control and Prevention (CDC) had reported there was a salmonella outbreak that was being attributed to meal replacement shakes, needless to say, I was worried. As you know, I am a huge fan of meal replacement shakes and it turns out that one of my favorite brands, Garden of Live RAW Organic Meal Replacement is the suspected cause of the outbreak. 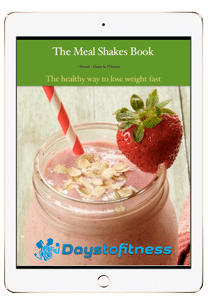 This meal shake is one of my recommended best shakes for weight loss. Salmonella has nothing to do with salmon fish but is, in fact, a type of bacteria that can cause illness or, more specifically, food poisoning. People mostly become infected because of dirty or contaminated water or foods, especially meat, chicken and raw eggs. The food poisoning caused by salmonella, properly called salmonellosis, usually lasts four to seven days, and most people recover without treatment. Symptoms normally develop in 12 to 72 hours so this is a fast-acting bacteria. In most cases, the disease is allowed to run its course and no medical treatment is required. However, in stubborn cases, doctors may prescribe antibiotics but only if the bacteria seem to have migrated into the blood from the stomach. I did some research and it turns out salmonella as actually quite common and of the nearly 3 million cases of food poisoning in the U.S. each year, around 1.4 million cases are attributed to salmonellosis. When it comes to risk to public health, the government is usually pretty quick to act and within days of the outbreak being discovered, the CDC took steps to halt the outbreak and safeguard consumers. Working with the CDC and the manufacturer, the Food and Drug Administration (FDA) initiated a recall of all tainted Garden of Life meal replacement products as a safety precaution. Online suppliers and retail stores were instructed to stop selling the potentially contaminated products and the public were warned about the danger of these products. It is HIGHLY unlikely that all products are contaminated but, when it comes to public health and safety, an over-reaction is better than an under-reaction. You can find a full list of the recalled products at the FDA.gov website. If you experience any of the symptoms that are associated with salmonella, I strongly suggest you get in touch with your health care provider. You probably won’t need any specific medical treatment but they will tell you the best way to feel better faster. 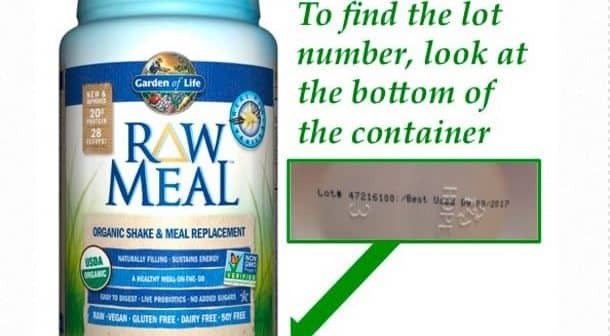 If you suspect that a Garden of Life contaminated product has made you ill, or have questions regarding the safety of your RAW meal replacement product, contact Garden of Life Retail Support Team at 1-866-211-9058 between 9 a.m. and 5 p.m. EST, Monday through Friday. To avoid what is actually a very small risk of salmonellosis in the first place, do not use any of the recalled products – even if you are part way through a tub and currently feel fine. It’s just not worth the risk to your health. Dispose of used and unused products and contact your supplier for a refund. New batches of Garden of Life Raw Meal Replacements are fine and tested free of salmonella so just make sure your tubs are from the newest, clear batch. Always wash your hands – especially before prepping food, before eating, after you have been to the bathroom, if you have had to change a baby’s diapers, if you have touched animals and pets, and after you do any gardening. Also make sure you keep raw and cooked foods separate in your fridge and store raw items below cooked items. Wash all fruit and vegetables before you eat them using warm soapy water or an antibacterial wash. Ensure all meat and fish is thoroughly cooked and think twice before eating raw eggs and raw egg products. Keep all work surfaces and cooking utensils spotlessly clean – again, use antibacterial liquid or wipes. If someone you are caring for becomes ill with salmonella, wash any dirty clothes and laundry on the hottest wash available to kill off any residual salmonella bacteria. Clean toilet seats and handles, taps and other potential bacterial hives with hot water and disinfectant to prevent cross-contamination. So, while salmonella is potentially serious it’s also quite common and caused by a whole lot more than tainted meal replacement shakes. There are a lot of things you can do to reduce your chances of getting salmonellosis and any contaminated Garden of Live products have now been recalled. Outbreak DOES sound like a scary word but with common sense and good hygiene habits, you should be able to avoid the salmonella bacteria. Previous ArticleIs a Smoothie Blender a Nice Gift ? Next Article Are Meal Replacement Shake Ingredients Safe ?